Obituary for Isabel "Peps" Barrios | Hondo Funeral Home, Inc.
Isabel “Peps” Barrios, age 49, passed away on February 6, 2019. Peps was born on August 19, 1969 in Hondo, Texas to Daniel Barrios and Maria Alicia Lopez Barrios. Peps is preceded in death by his mother; his sisters: Veronica Barrios and Valerie Ann Barrios, and brother: Eddie Barrios. 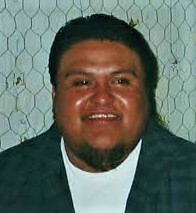 He is survived by his wife: Lisa Barrios; son: Justin Ray Barrios; daughter: Sabrina Fay Barrios; Father: Daniel Barrios Jr. (Julie); sister: Nichole B. Perez; his brothers: Daniel Barrios III (Belinda) and Johnny Barrios (Paula); his best friend: Reynaldo Sanchez (Elizabeth) and numerous nieces and nephews.